I love Escape Rooms. My inner child, who used to adore Crystal Maze, is in her element, solving clues and opening padlocks, all in the hope of getting out of a room within an hour. Regular readers will know I first discovered Hint Hunt with The Enigma, and have been back since on a double date with The Rugby Boy and two of my good friends. 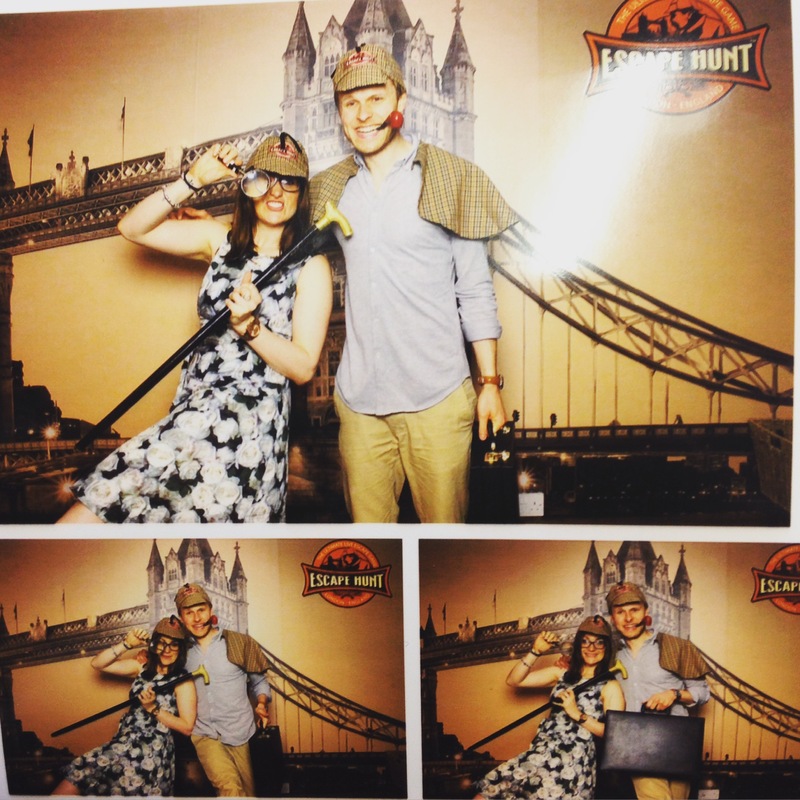 And so when I heard Match.com was throwing a singles event in an Escape Room, there was no way I wasn’t attending … even if I’m not single anymore! (Don’t worry, I attended as press, not a singleton … but it did still mean I could check out exactly how it all worked). The first challenge of the evening was actually finding Escape Hunt. Buried deep in the City, George Yard (where Escape Hunt is located) is also a popular post-work drinking spot, so it took me a while to find the venue’s doorway behind all the pissed-up city types. Once inside, you go down a LOT of flights of stairs before you’re in Escape Hunt. But the couple of minutes disorientation is worth it. 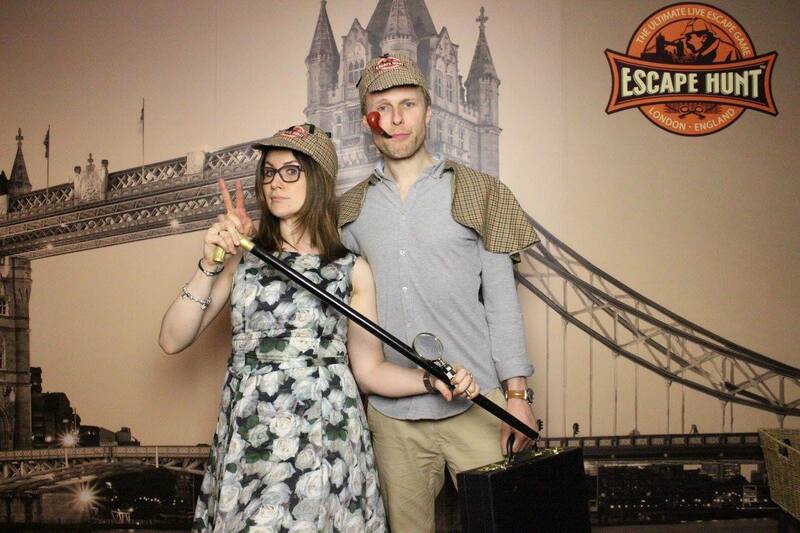 Unlike Hint Hunt, which is rather squashed, and feels rather temporary, Escape Hunt is a sprawling maze of different escape rooms, with a plush looking waiting area. The staff all wear Sherlock Holmes-themed uniforms (which you can try on yourself at the end, hence the photo above of me and TOWTS). I can see why Match.com chose the event. I’ve always been a big fan of unorthodox dating events. And as you all know, I’m a big fan of doing stuff you want to do anyway, when you’re dating. That way even if you don’t meet someone you fancy, it’s not a waste of an evening. And so in theory that logic applies to the Escape Hunt singles event. It’s a really fun activity you want to do anyway, and you need a team of 4 or 5 to do it with, so why not make those other 3 or 4 people all singles, in case you might meet someone at the same time. And I realised that ‘but’ as soon as we were locked in the room together! Ignoring the obvious comedy that it’s a dating event where you’re locked in a room with a load of complete strangers, in the hope you may fancy one of them …. the very nature of an Escape Room is that it’s high-pressured. It’s confusing and dis-orientating, and the whole nature of it is that you have a limited amount of time to solve a load of random clues in order to get out again. Which means everyone panics! Panic mode is not hot! In fact, for some people (me included! ), panic mode is quite bossy. I remember, back when I had my first date with The Enigma, that whilst one part of me was in my element – because I LOVE the whole idea of an Escape Room, the other part of me was worrying that he was seeing me at my most basic. All politeness and airs and graces go out the window! Even when I did a panic room a few months ago with my boyfriend, I came out worrying that I might no longer be his favourite person, after I pointed out his maths was wrong, and made a bit of a dig about how slow he was putting a battery in a torch! As I stared around the Escape Room – with some strangers rudely barking orders at others, and some standing around completely hopeless, looking like they didn’t even know why they were in the room, suddenly everyone (myself included) became extremely unattractive! And surely a large part of a singles event is that you want to look attractive to the other person? I had a really fun evening (as did The One With The Sign, who came with me, and is in the photos above). But I certainly wouldn’t go there to try to pull! As we emerged from the room, there was this odd sense of camaraderie between us … as if we had survived some kind of ordeal together. But that didn’t mean I ever wanted to see anyone in the room ever again! Top marks to Match.com for originality, and for coming up with a dating event which isn’t speed dating, or some ‘original’ take on speed dating. But unfortunately I don’t think Escape Hunt is the perfect setting for a singles event. A date night on the other hand may be a different matter … If you are brave enough to head there with your other half (or with someone you’ve been on a couple of dates with), then one definite bonus is that Escape Hunt offer rooms for 2 people (something Hint Hunt doesn’t do). And they are affordably priced – so it’s just £29 each (only £5 more than you pay if you go on a double-date, with 4 of you in the room). My choice would be a double-date once you’re in a relationship – I loved the one we did a few weeks ago with my friend, and with 2 other people in the room, you’re less likely to have a domestic!